Home Finance Terms What is Overcapitalization? It is a financial situation where a company has more than enough total capital as compared to the needs of its business operations. In case of overcapitalization, the total equity (owner’s capital + debt) of a company exceeds the actual worth of its assets. An overcapitalized company may often be burdened by interest payments or payment of profits as dividends to shareholders. It may not be always correct to recognize excess capital as overcapitalization as most such firms suffer from lack of liquidity, a more reliable indicator would be the earnings capacity of the business. Overcapitalization may occur when the return on investment earned by a company is exceptionally lower with respect to other similar companies in the same industry. 1. Poor planning of initial equity requirements may result in overestimation of funds. 2. A high amount of preliminary expenses may be a reason for overcapitalization as they are shown as assets i.e. fictitious assets in the balance sheet. 3. Insufficient provision for depreciation consumes unnecessary profits and reduces the overall earning capacity of the company. 4. Acquisition of unproductive assets or buying them at inflated prices may also result in overcapitalization of a company. 5. A sudden change in the business environment due to a shift in the domestic, international or political environment may reduce the earnings of a company. 1. 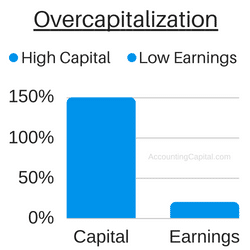 Overcapitalization may result in a decline in earnings capacity of the company which may consequently lead to fewer profits & lesser dividends. 2. Degraded earnings would hint towards instability of business operations which may consequently lead to a downfall of share prices causing a ripple effect. 3. Investors may lose confidence in an overcapitalized company as there may be no assurance of any income due to low earning capacity. 1. Repayment of long-term debts to reduce the interest payments may help an overcapitalized firm to relieve the problem. 2. Debt restructuring with banks and other lenders to reduce the interest obligation is another possible remedy. 3. Reduction in face value & buyback of shares. 4. All official expenses should be minimized and a conservative dividend declaration should be planned. 5. In extreme conditions, the company may choose to merge be acquired.